Velcro free, wipe clean, infection control, heavy duty Vinyl outers. 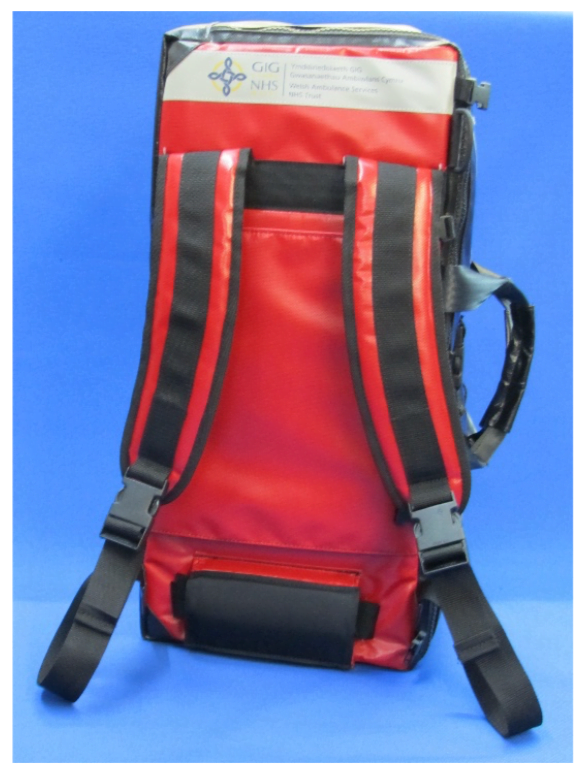 This pack has top and side carry handles and a full foldaway backpack. 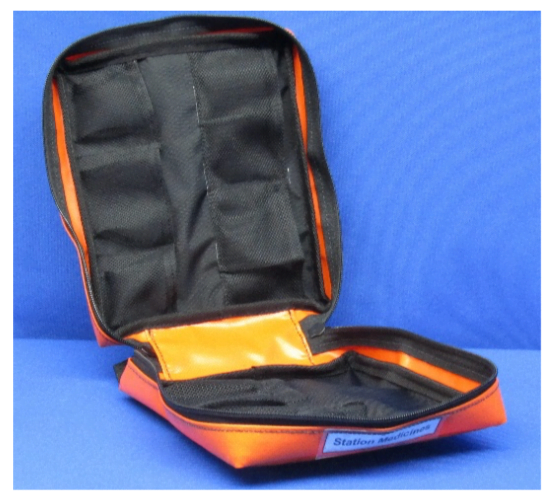 There is a fixed lower front pocket and a detachable top diagnostic module. 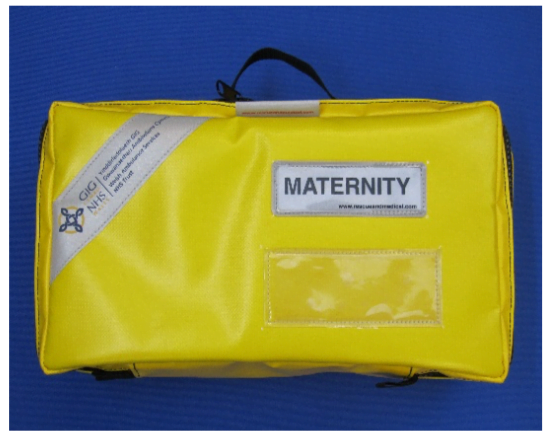 Internal oxygen sling is available. 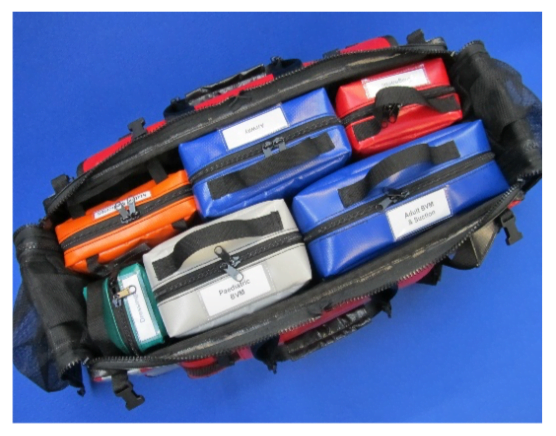 All removable internal pouches have two zip pulls to seal for make ready and are colour coded with ID facility. 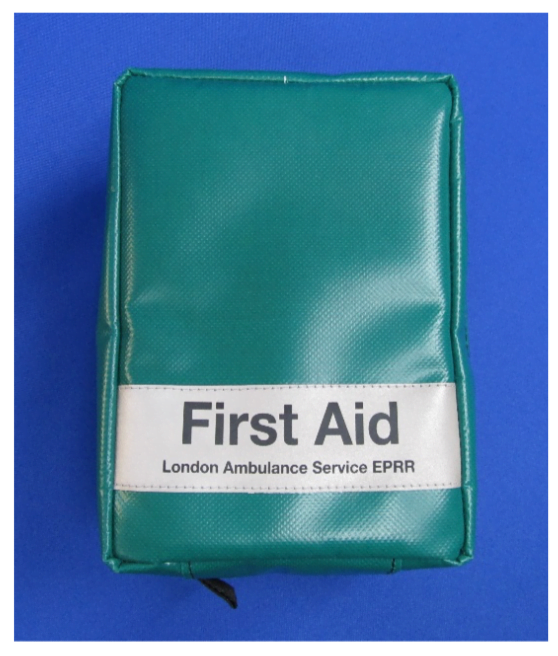 Available with Velcroed lightweight washable pouches, price on request. 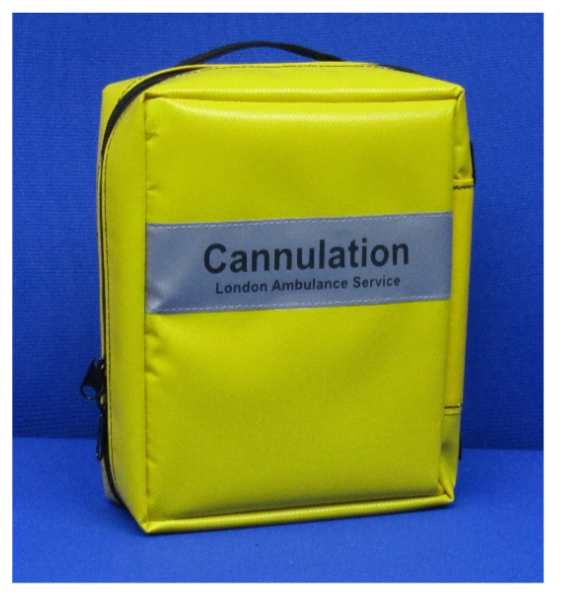 As the above BLS, but with the advantage of a separate oxygen access port and external sharps box pouch. 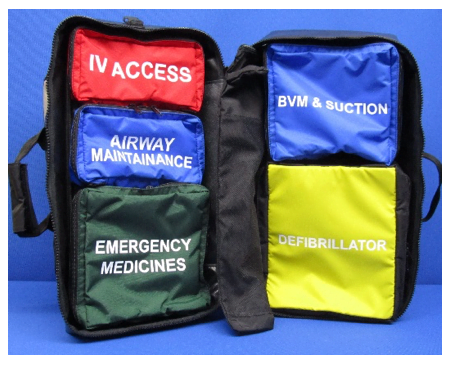 All removable internal pouches have two zip pulls to seal for make ready and are colour coded with ID facility. 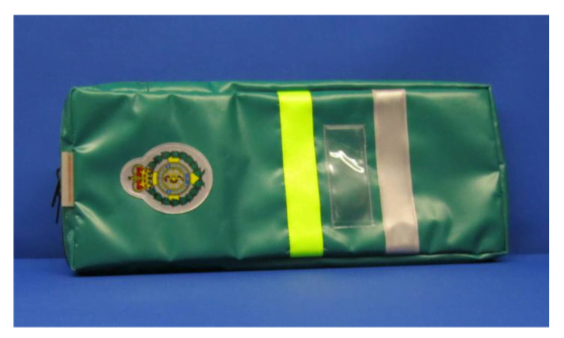 A compact Oxygen Pack, manufactured in I/C, heavy duty, wipe clean Vinyl with a robust bias weave for added strength. 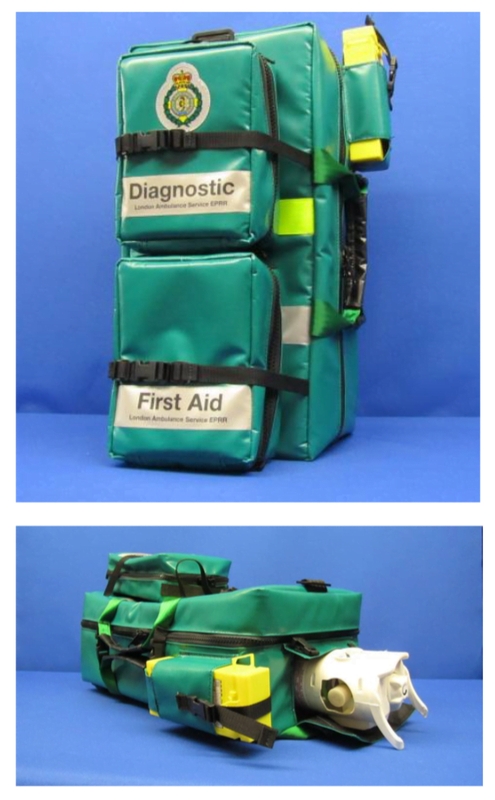 This new Velcro free, fully modular pack is part of a Rapid Response two pack system. 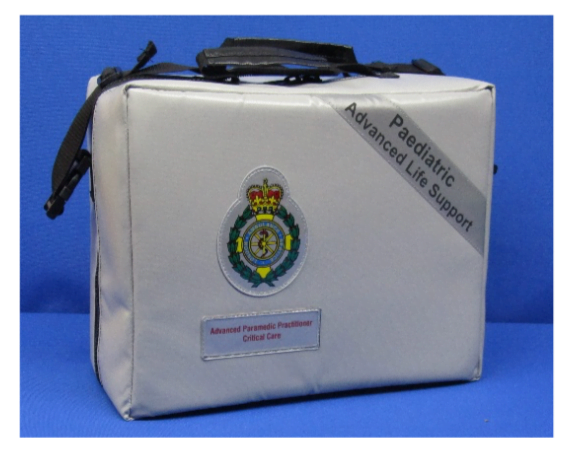 It is designed for single Paramedics working alone. The pack has a full backpack system, waist belt and lumbar support. The quick close handles allow the pack to be grabbed quickly without closing the zip. 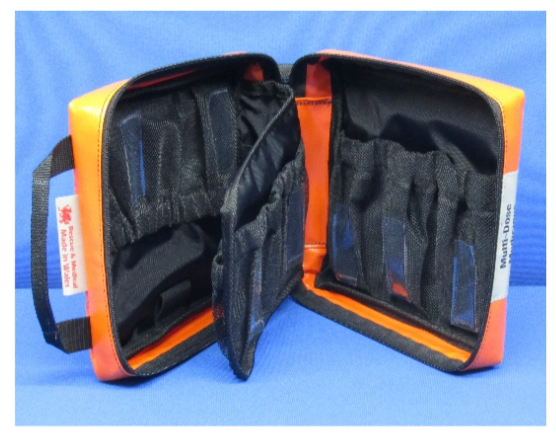 There is a dedicated sharps box external pouch on the side, and quick release square link attachments on the front of the pack to take modules. 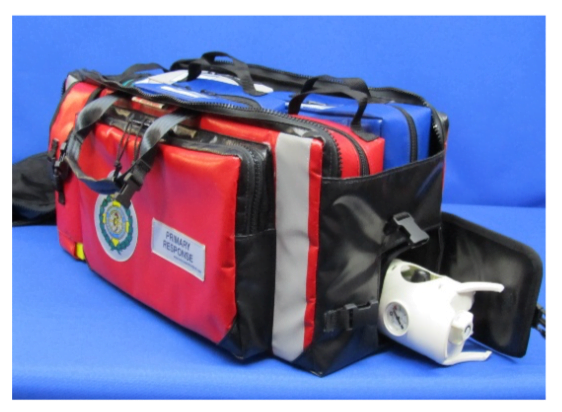 Inside there are dedicated BVM, oxygen mask, and I-Gel pouches that sit either side of the oxygen cylinder. The cylinder sleeve has a dedicated pocket with access from the top external flaps. This allows the cylinder to be removed from the pack whilst it is still closed. The opposite side has two compression mesh flaps, which retain the front pouches or modules. Internal photos show fully pouched, external photo shows how a selection of modules can be attached. 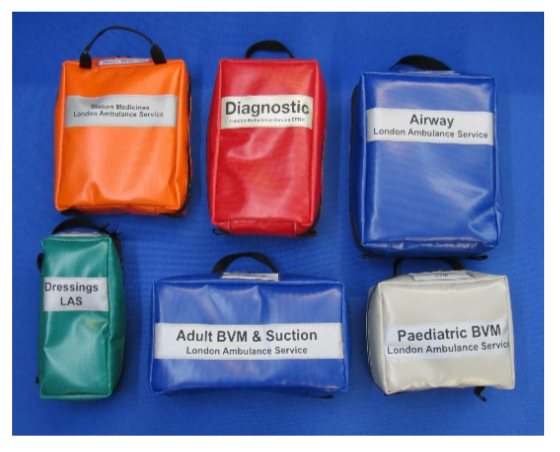 Fully organised with mesh pouches both sides, centre board with elastic straps one side and a mesh pouch opposite for stethoscope. 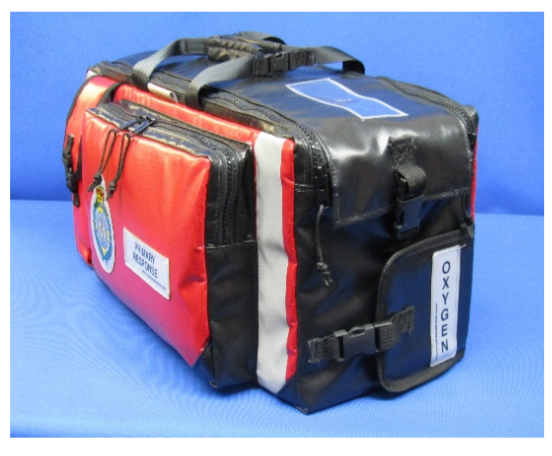 The outer is the same I/C wipe clean material and has the same square link attachment for RR oxygen pack front. Optional belt loop attachment and leg strap available. 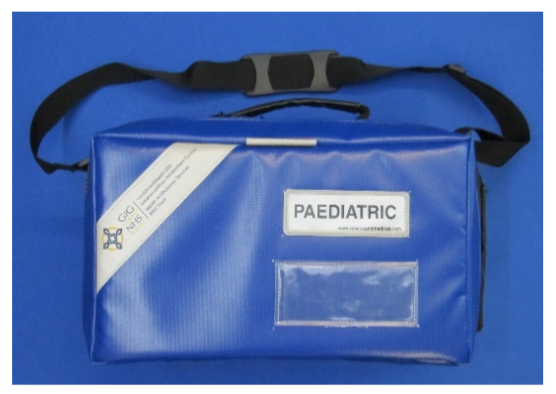 Same attachment options as the Diagnostic pouch. 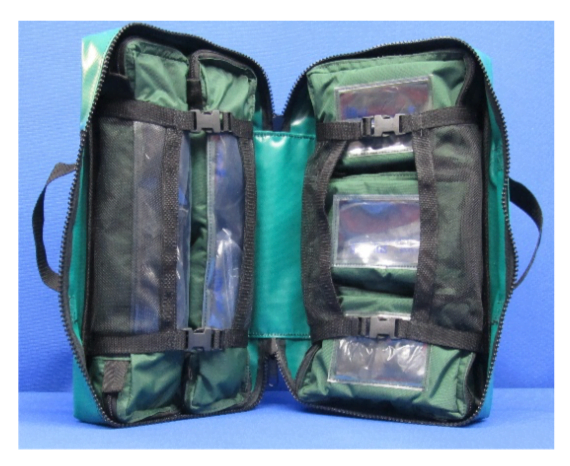 Inside there are three mesh pouches to organise first aid items. 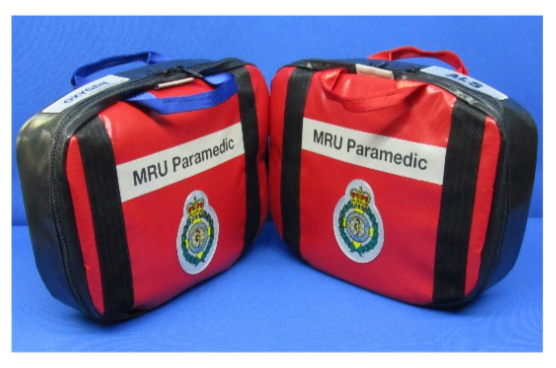 Full length Collar Module that will attach to the front square links of the Rapid Response Pack and can be pulled tight with compression straps. 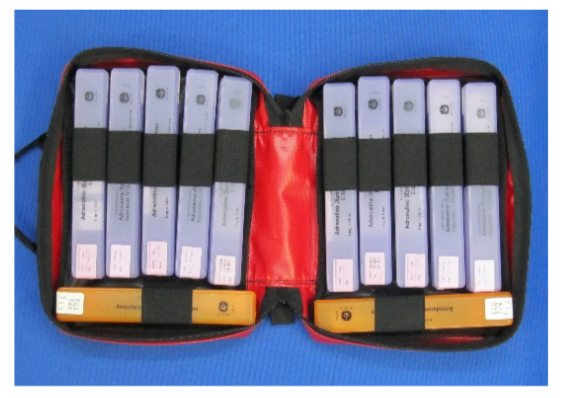 There are several electronic patient record modules for various tablets or I-Pad. The one shown is for an I-Pad. 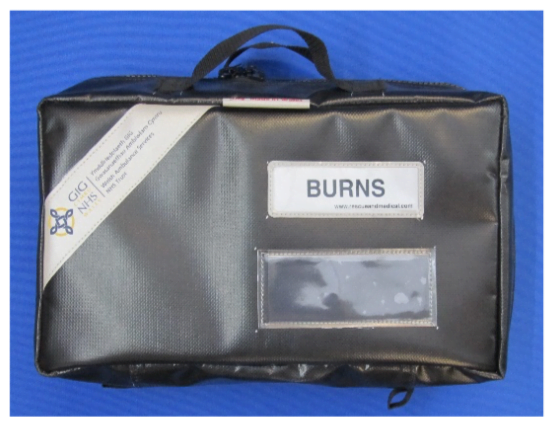 This module can be either attached to the outside of the RR Oxygen Pack or secured on the inside with the mesh compression flaps. Manufactured in the same I/C material as the main bag. 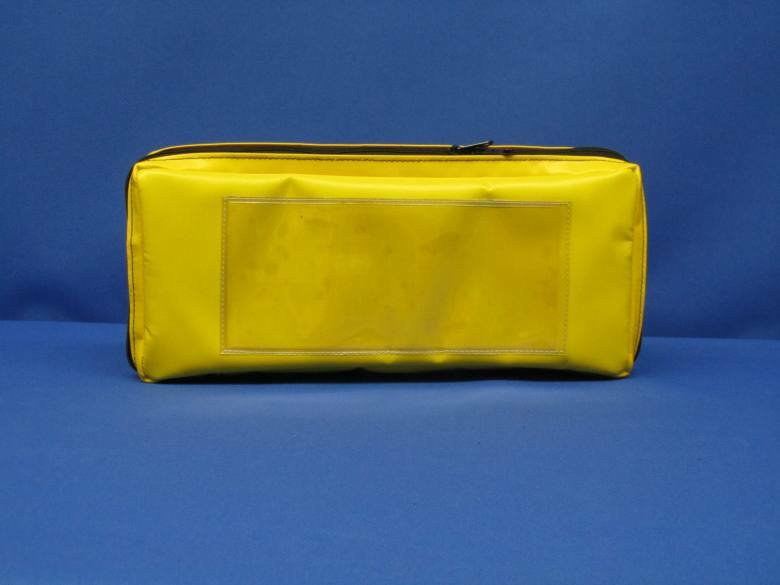 Inside the front there are elastics for I-Gels and the centre has eight mesh intubation tube files for tubes in packaging. The rear section has multiple elastics for blades, handles, Magills etc. 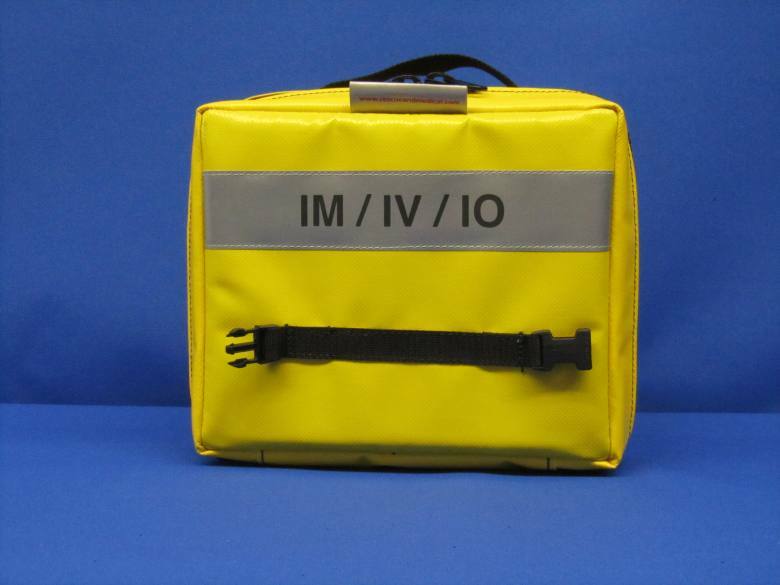 This module can also be attached to the front of the RR Oxygen Pack or can sit next to the Intubation Module inside the front of the RR pack. 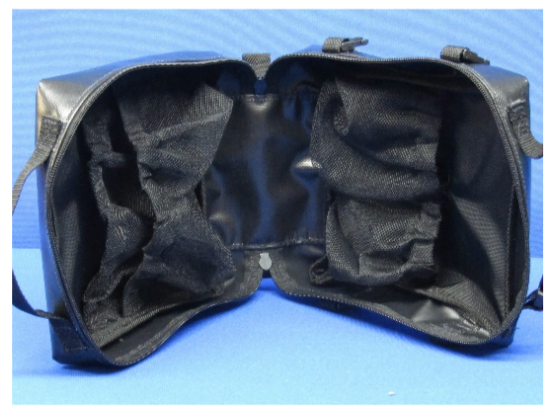 The front inner has elastic loops for Venflons, syringes etc. There are internal centre boards for dressings, flats etc. The rear section is for IO Gun etc. 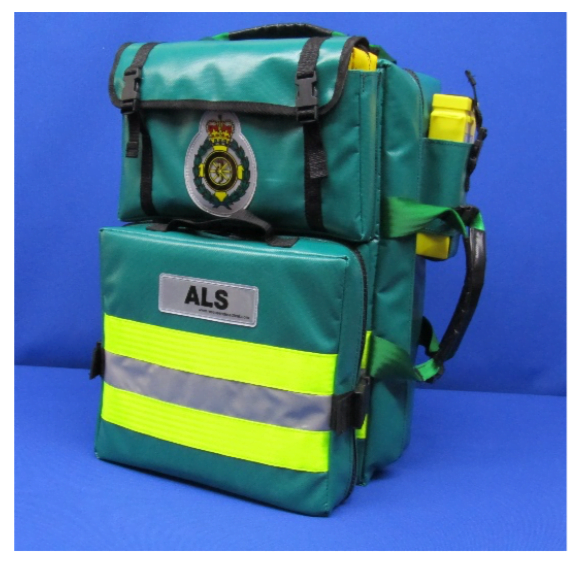 Velcro free and manufactured in I/C Vinyl, the RR/ALS has a full foldaway padded backpack complete with waist strap and lumbar pad, plus top and side carry handles. 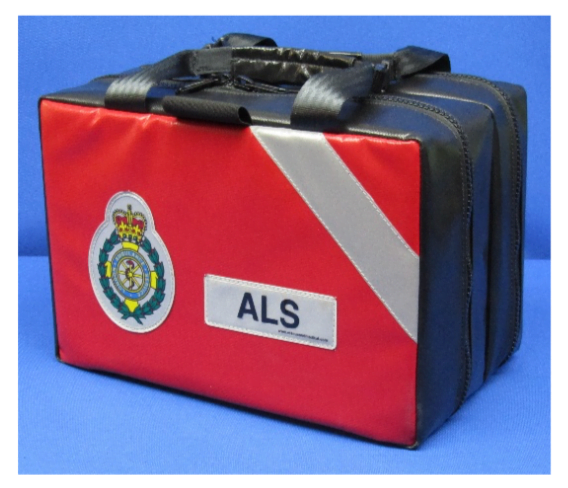 Fixed outer top pouch with two organised medicines pouches, external sharps box pouch and removeable lower fully organised ALS Pouch. The top has an oxygen access port, for separate cylinder removal without opening main bag. 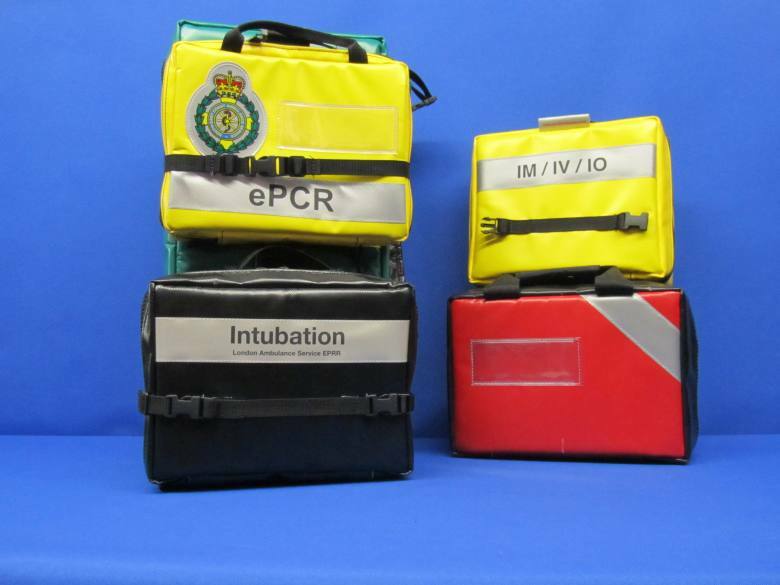 The inner section has fully organised individual colour coded modules that have two zip pulls to seal for make ready and are colour coded with ID facility. Manufactured in I/C wipe clean Vinyl. 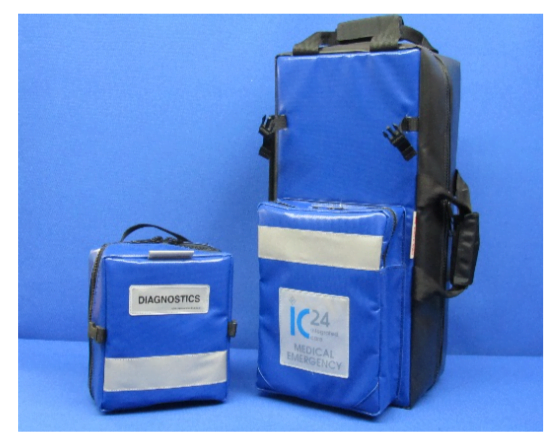 It has a full foldaway backpack, dedicated sharps box pouch and a large front pouch for drug pouches and modules. 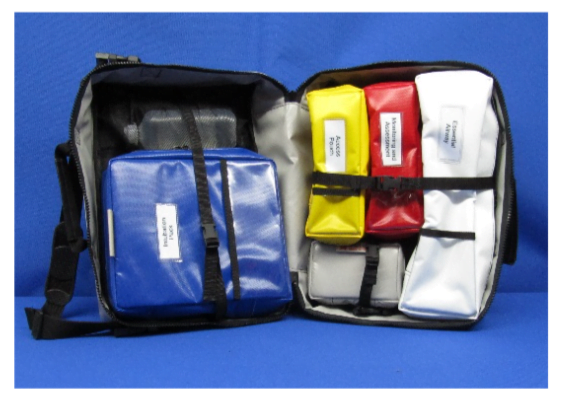 This Velcro free pack has internal mesh compression flaps to secure the large colour coded zipped internal pouches. 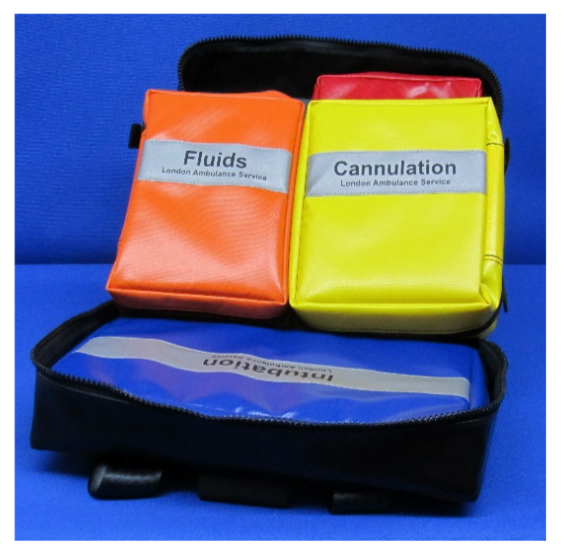 Organised modules; Cannulation, IM/IV/IO and Intubation are also available and will fit into the PRP. The large pull through handles enable the pack to be moved quickly without completely zipping the pack together. 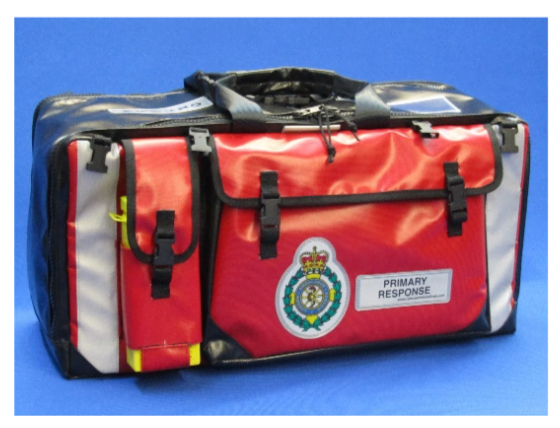 Designed to sit in the inner front section of the Paramedic Response Pack. Secured with SR buckles, the module can be opened out flat to form a clean work surface. 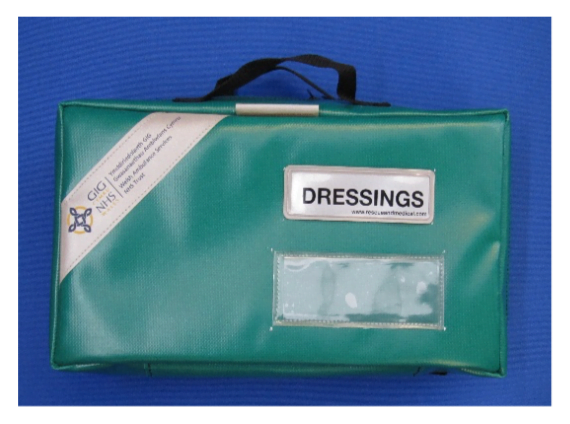 It has mesh files for tubes and fixed mesh pouches for flats, dressings, tape etc. It also has fixed elastics for handles, blades, Magills etc. Made to same I/C wipe clean specification. 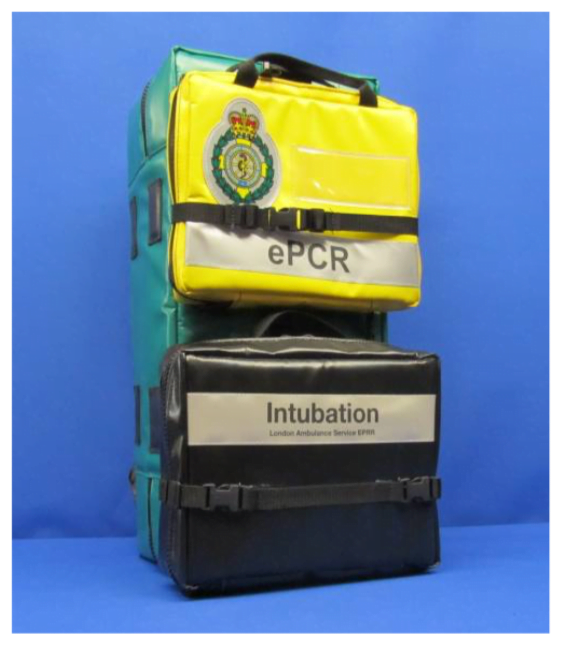 This module sits alongside the intubation module, inside the front section of the Paramedic Response Pack. The inside front section is for Venflons, opposite centre board for syringes etc. and rear for dressings and flats. The rear section of the module is for IO Gun etc. Made to same I/C wipe clean specification. Top opening packs with the aim to reduce the working footprint. They all have fully padded, foldaway backpacks with waist straps and lumbar support. They all have front pockets for document or I-Pad, which are always upright, and off the working area to reduce contamination. All manufactured in wipe clean, infection control, chemical resistant, heavy duty reinforced Vinyl and are Velcro free. All the fully organised Make Ready Modules can be removed from the top opening and are made of the same heavy duty Vinyl. They have two zip pulls to seal for make ready and are colour coded with ID facility. All PRO Packs have the facility to carry oxygen. 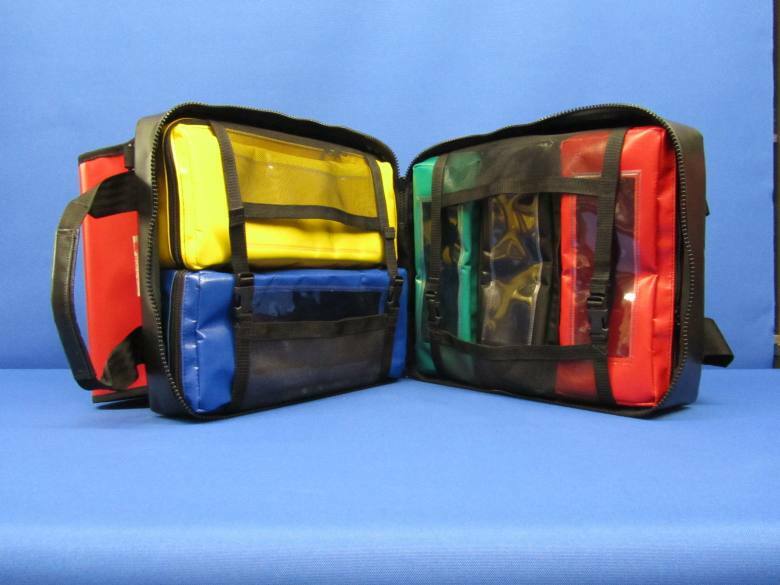 All prices are for bags complete with internal modules. Internal modules also available separately, prices on request. 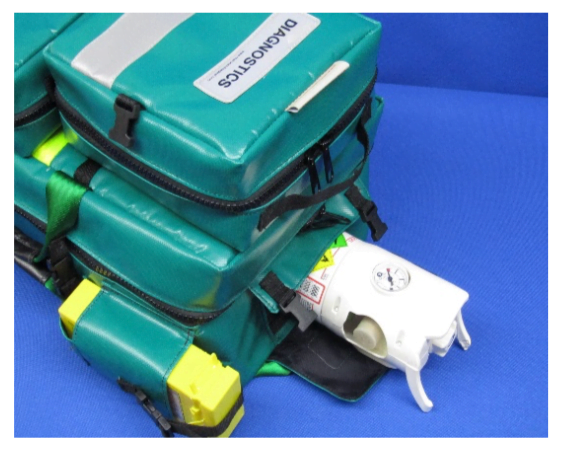 This pack has a CD oxygen cylinder retainer in the base and a twin opening top with oxygen mask storage. 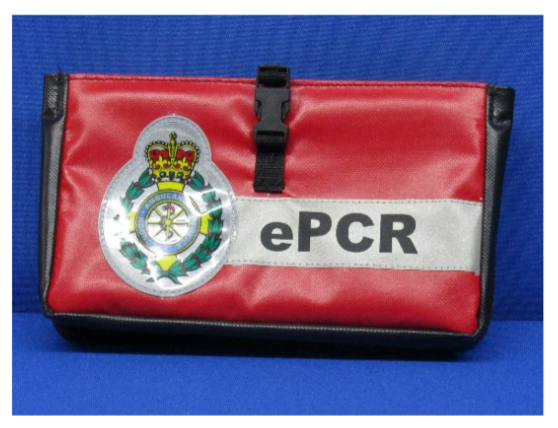 It has a storm cover and front pocket for equipment or I-Pad. 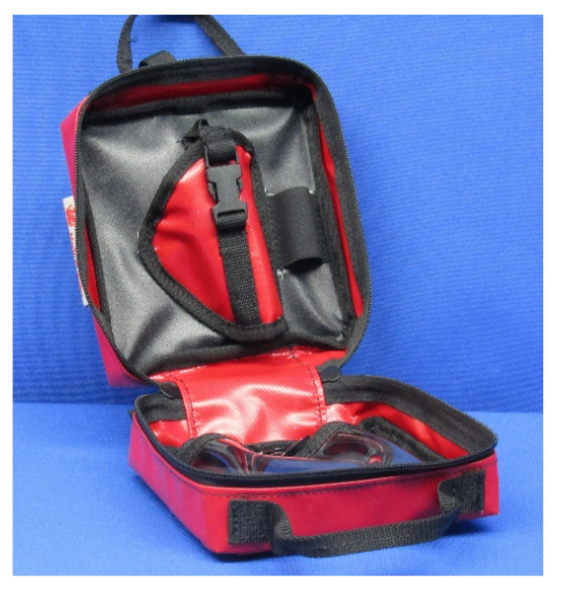 This pack has a CD cylinder retainer in the base and a twin opening top with external sharps box pouch and I-Pad pocket. 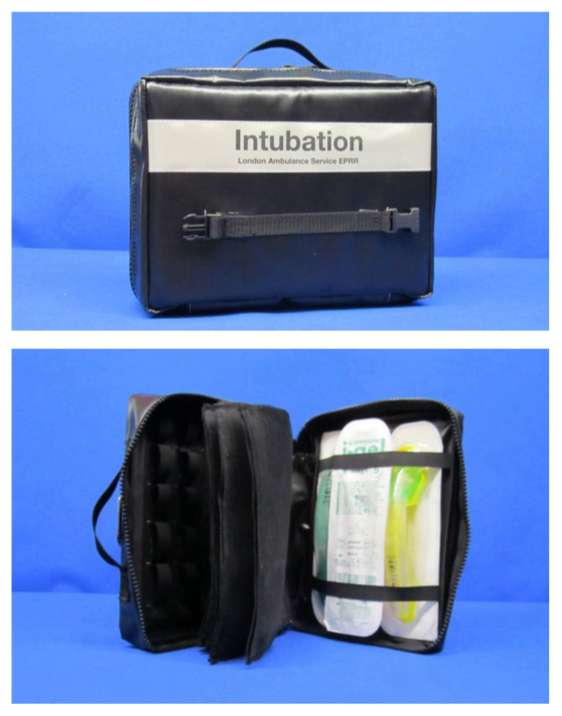 This pack has a twin opening top, external sharps box pouch and a large front pocket for I-Pad & Fluids. 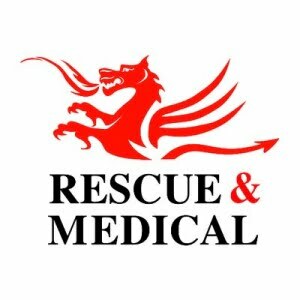 • Large Airway Management with Intubation. 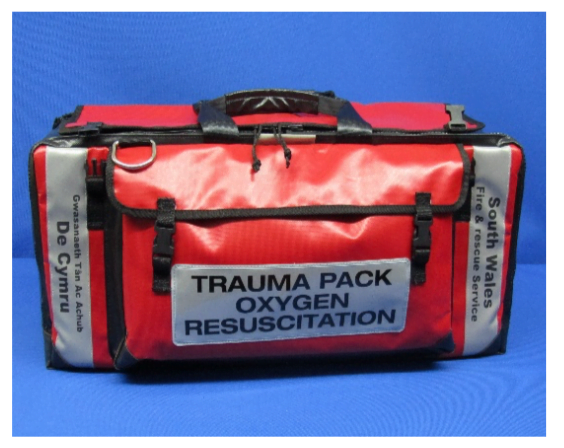 This pack has a single top opening zip flap with oxygen mask storage. 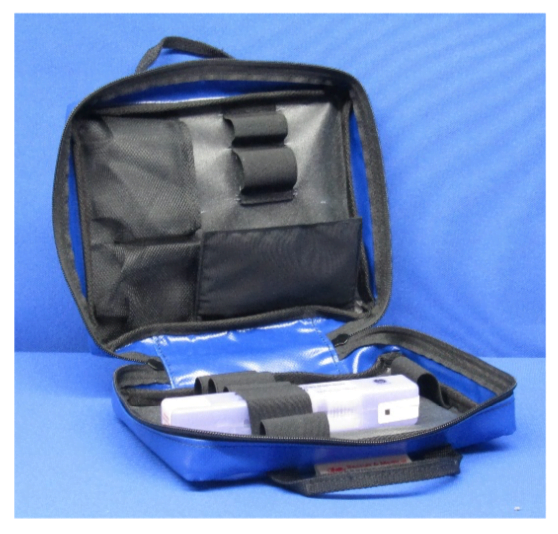 There is an external sharps box pouch and the front I-Pad pouch has a twin pull zip closure. The oxygen cylinder can be removed without opening the main bag. 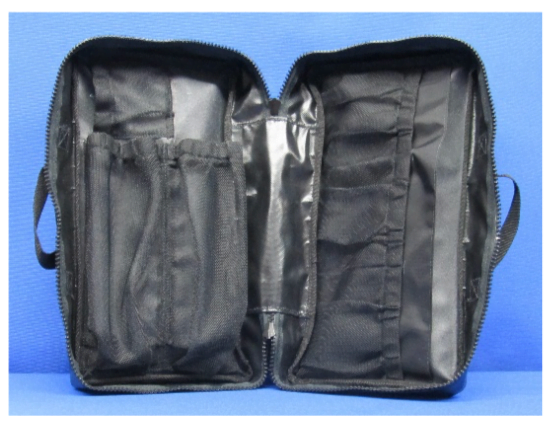 Velcro free, twin section box bag. Manufactured in wipe clean, infection control, chemical resistant, heavy duty reinforced Vinyl. 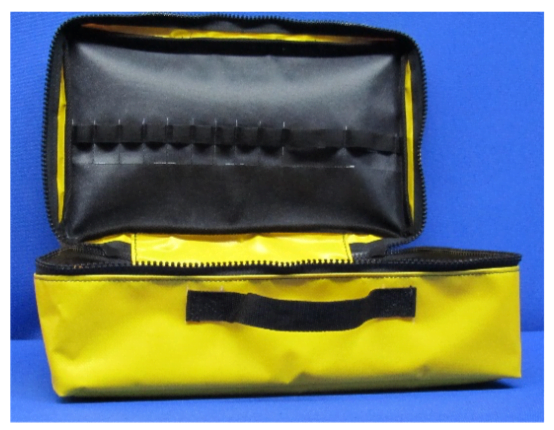 All zips on main bag and internal modules have two zip pulls that can be sealed for make ready. The front section is colour coded yellow. 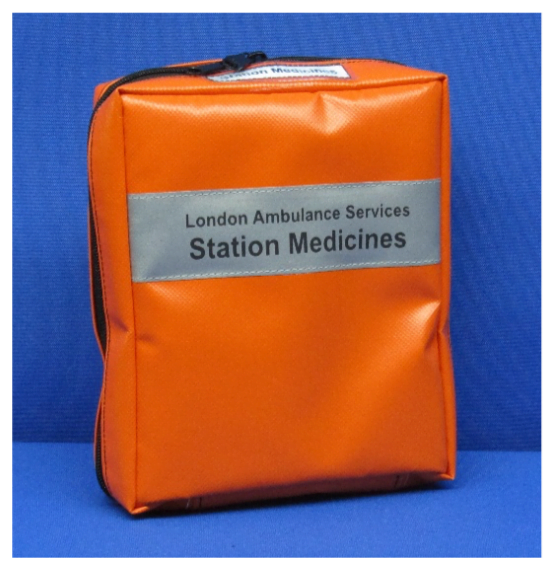 This section will accommodate drug modules already in use by Ambulance Services. 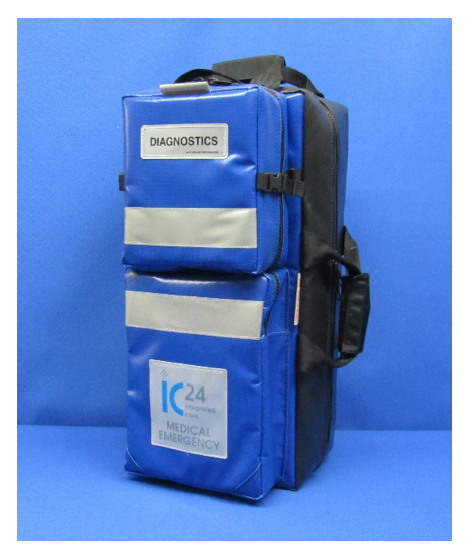 We can also supply drug modules, price on request. 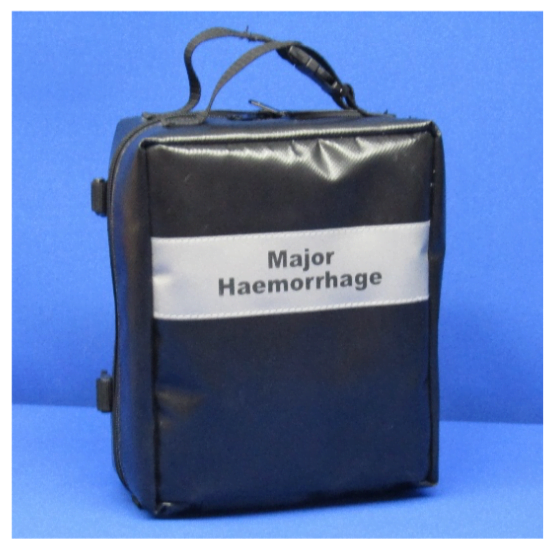 Rear clear contents sleeve, Velcro free, wipe clean module with top carry handles and fixed shoulder strap. 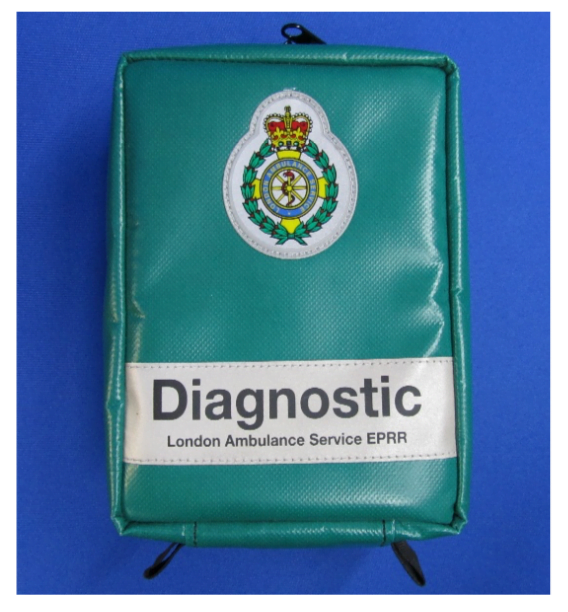 Interior has rear mesh pouches for Defib. pads and fluid bags. 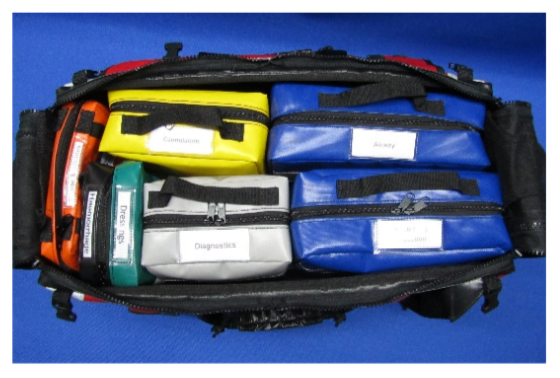 On top of this is a fully organised intubation pack. 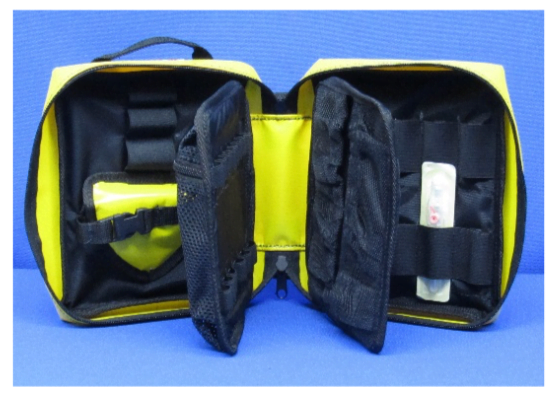 On the opposite side, there is an access pouch, monitoring and assessment pouch and essential airway pouch. 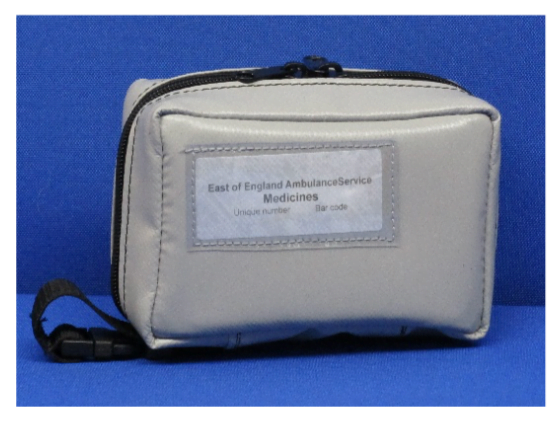 All pouches have document sleeve and recognition labels and internal organised fixed mesh pockets. At the side next to the access pouch there is a retaining strap for two infusion bottles. All locker modules are manufactured in heavy duty, wipe clean Vinyl. 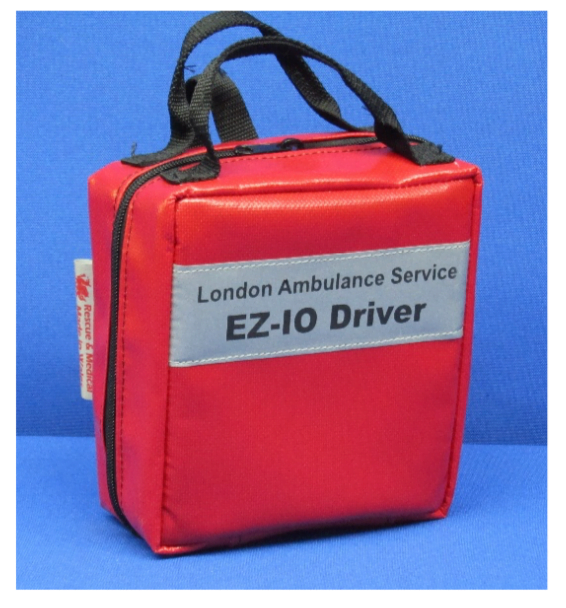 All are the same width/height and have top carry handles, ID sleeve and labelling. Twin sealable zips. 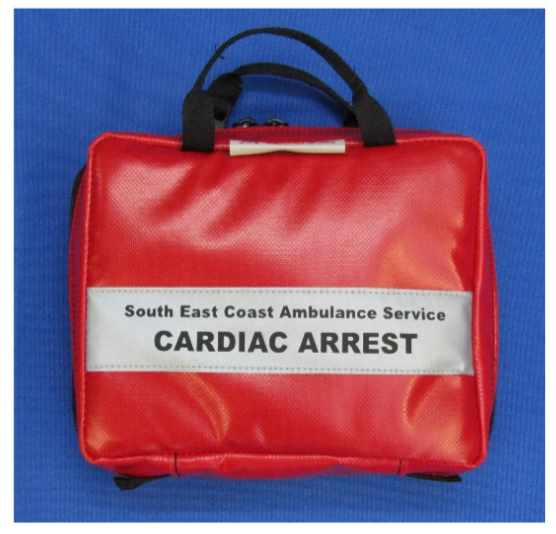 These Make Ready Velcro free modules can be barcoded. 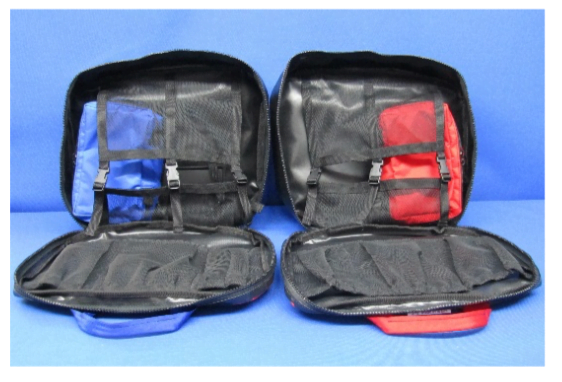 2 large and 3 small removable windowed pouches with contents sleeve. 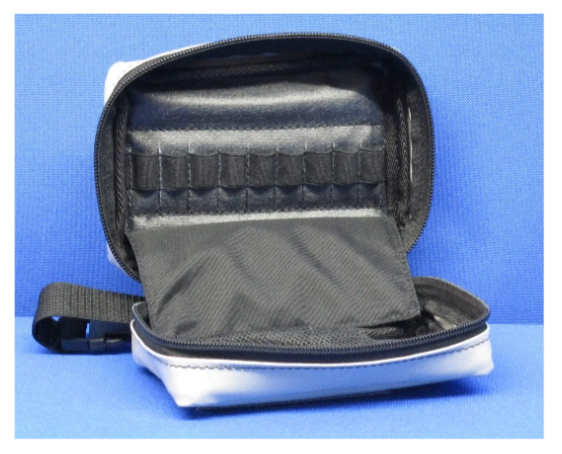 Sealable zips held in place with mesh cover flaps. One side has interior mesh pouches organised for burns, dressings etc. The other side has pouches for saline bottles, etc. Twin offset zip leaving a larger rear compartment for delivery pack. Front has elastic organised area. 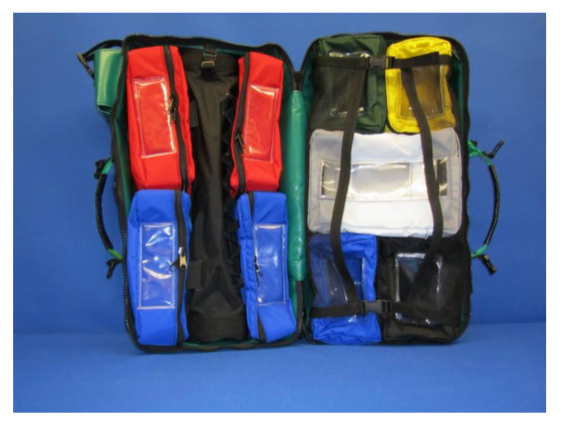 The deepest of the modules with top and side middle zips and carry handles with fixed shoulder pad. 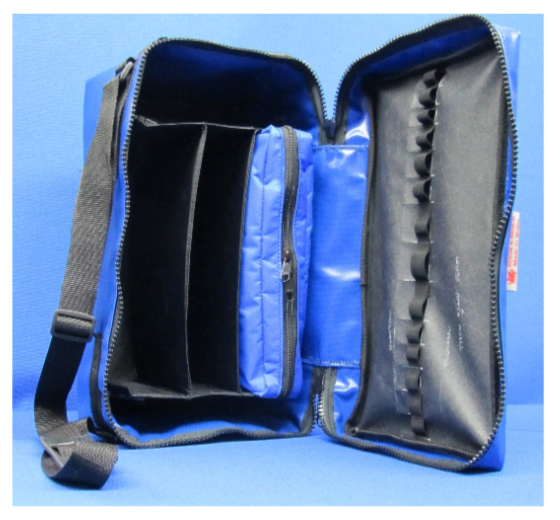 The inside lid has elastic organisation and the rear has 5 separate contents sections with one removable airway management pouch. 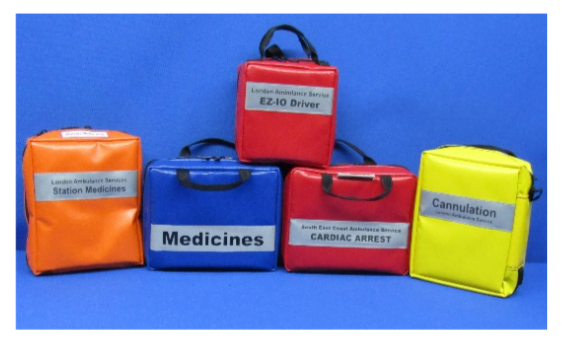 A twin pack system, with each pack colour coded and labelled. 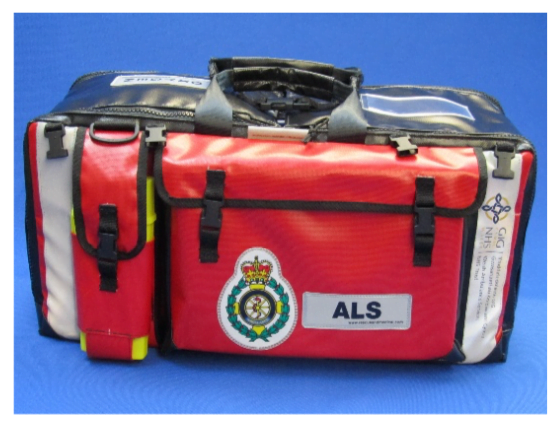 Oxygen and ALS designed to fit into shaped side panniers. 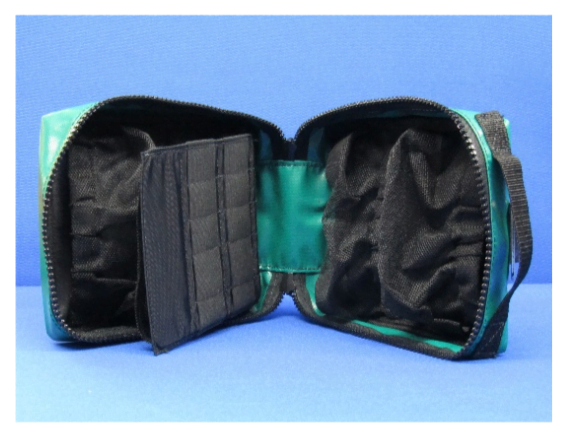 Internal pouches are Velcro free and wipe clean. 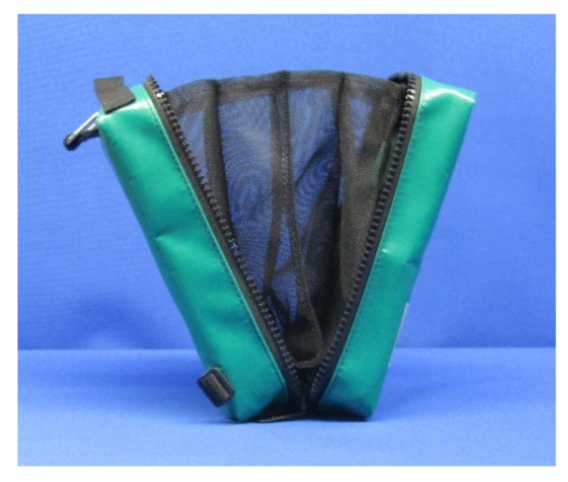 Additional side pouches are available for extra equipment storage behind leg bars. 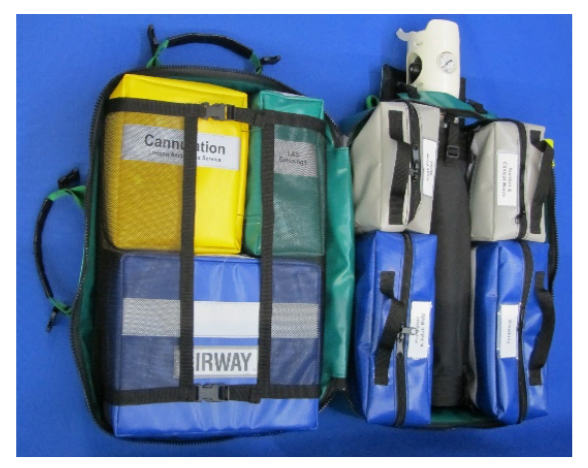 Seven bag system for the 169 helicopter. 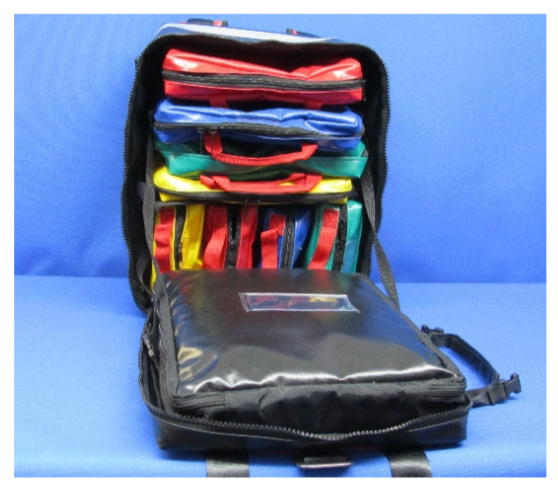 Consisting of primary and secondary large back packs and two back up packs with reduced width. 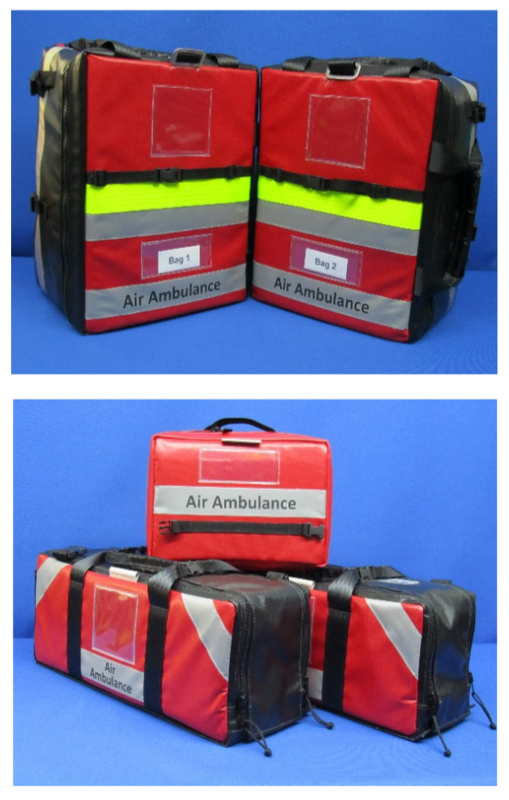 All are labelled, colour coded, wipe clean, with organised pouches and a retaining strap system to secure into aircraft. 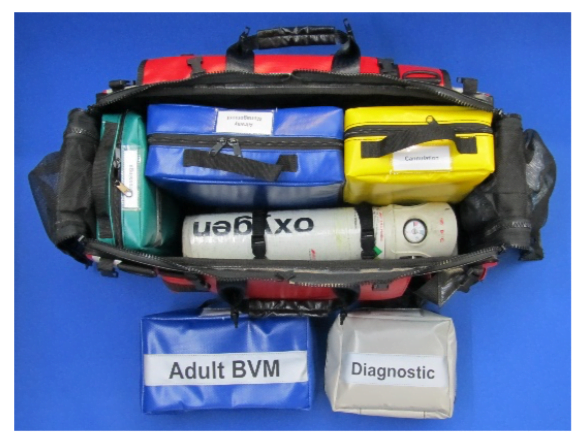 Also includes a medicine module and two stacking packs, oxygen pack and larger drugs pack, again with retaining system. 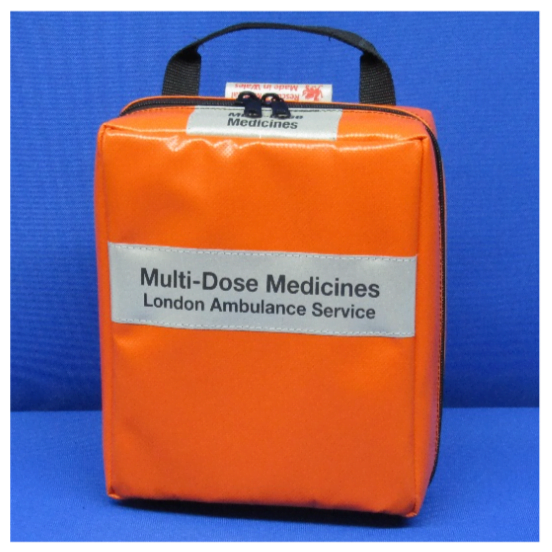 Medicines module will attach to the front of any of the four back packs. Individual modules available, prices on request. Heavy duty, stand-alone module. 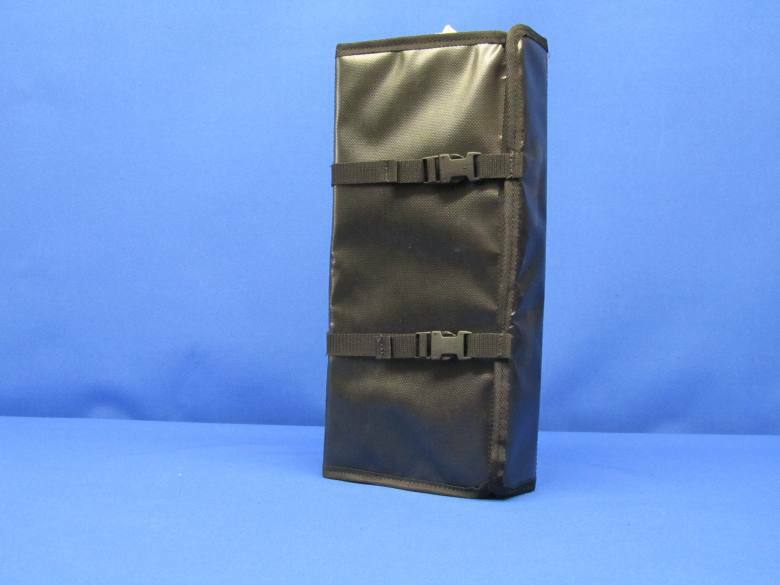 This module has a top carry handle, twin zip opening and a rear document sleeve for contents list. Inside there is a front section for two rows of Venflons and a centre board section for needles and flats. The other side has a second centre board for a selection of syringes and for EZ I-O needle packs. 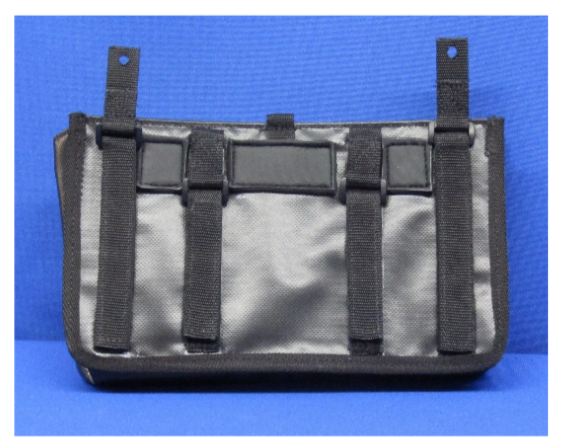 Inner rear has EZ I-O holster and retaining strap with storage for large syringes. 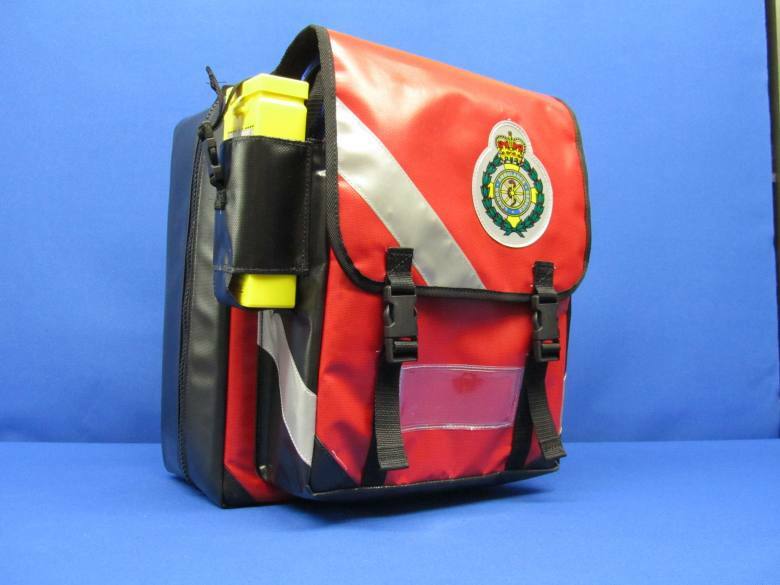 This module has a top carry handle and a rear break handle for attaching to Drug Bag or Paramedic Pack. Inside one side there is a see-through pouch for I-0 needed packs, and inside the other a padded holster and large syringe elastic. Wipe clean, sealable zips. 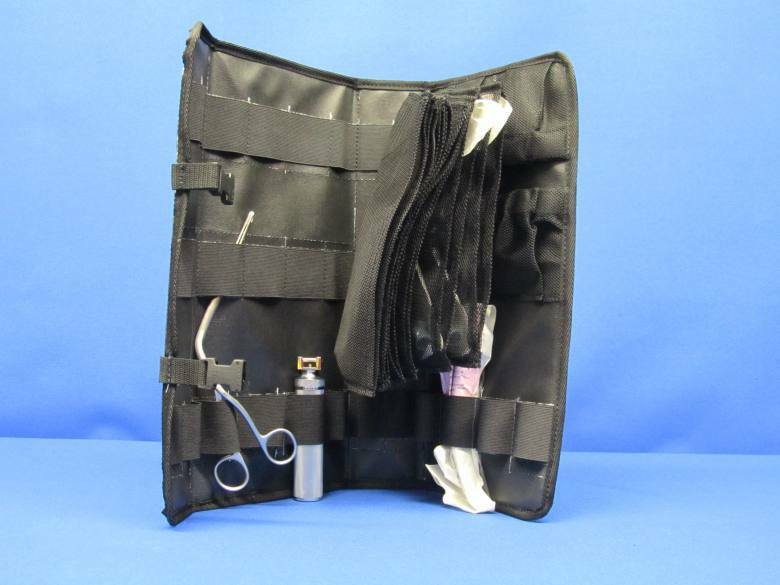 Slip holster for electronic patient systems. 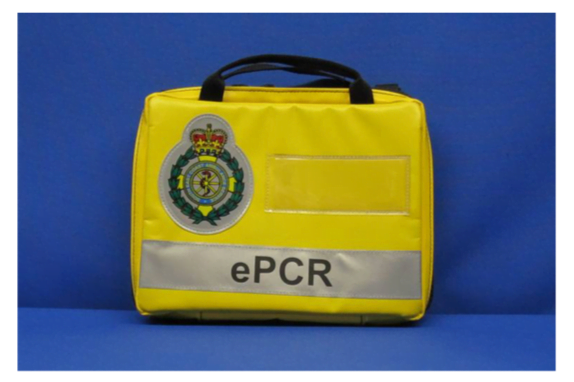 This can be attached to Strycker or FW patient trolleys sides for storage of tablet or I-Pad systems while patient is being manoeuvred. Wipe clean, Make Ready Module with top carry handle and SR break strap for attaching to any response pack carry handle. Inside are mesh fixed pouches for dressings and tourniquets. We are currently building a selection of stand-alone Make Ready Modules that are easy to pack, easy to use and can all be sealed individually. Labels are numbered and barcoded. 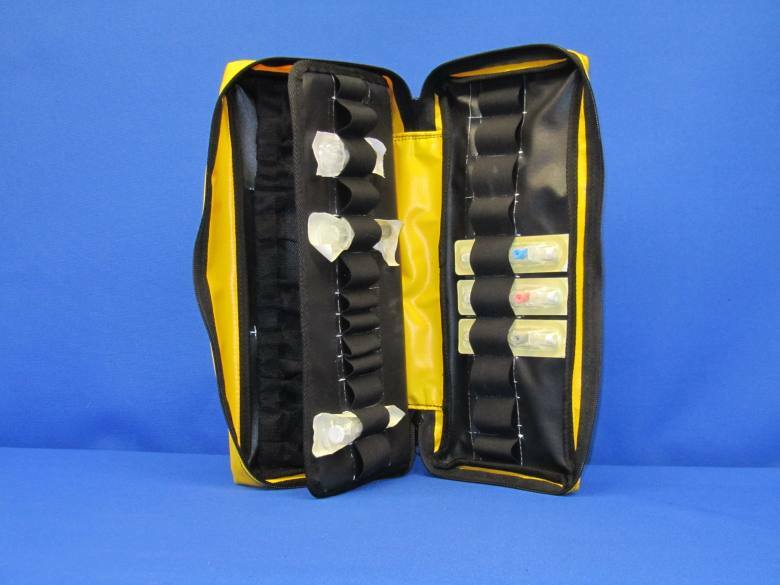 This module holds 12 prefilled syringes and has a break top handle for attaching to Defib. Monitor. 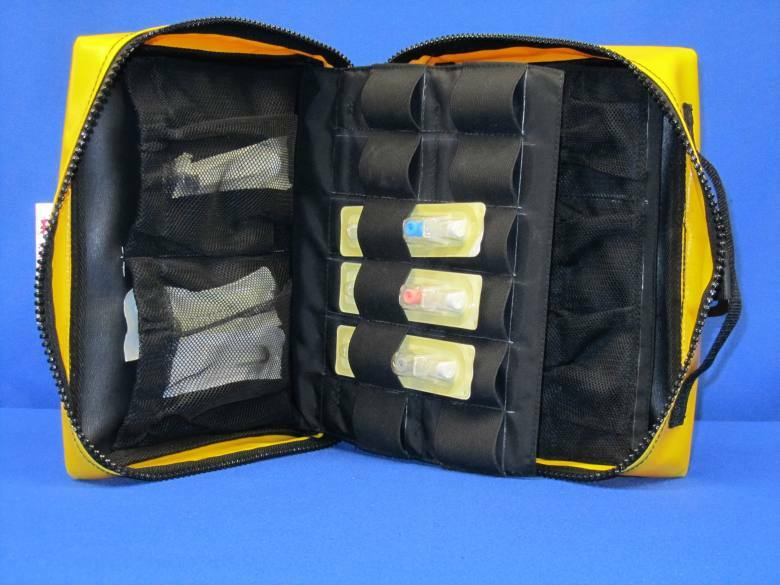 Organised module for ampules, prefilled syringes, boxed medicines, GTN, EpiPen, etc. 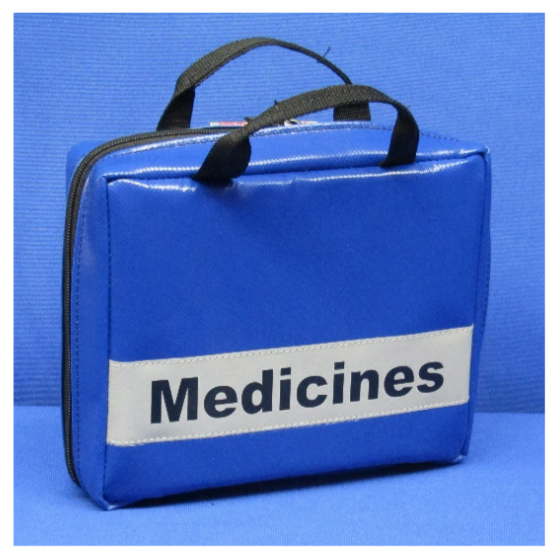 Organised for boxed and bottle type medicines; Paracetamol, glucose gel, Ibuprofen, Glycerine Trinitrate, etc. 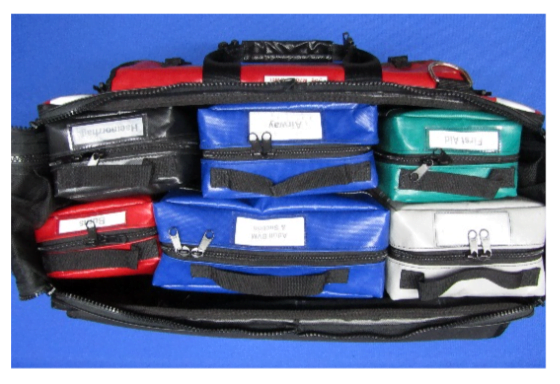 Internal open mesh pouches, each with individual sleeve for labelling each medicine. A very flexible pack for a large selection of packaged medicines. Padded and stiffened for Morphine, Diazemuls, rectal tubes etc.